Mkhitaryan's move to Arsenal has not revitalised his career. Arsenal fans have a song for Henrikh Mkhitaryan, one which is sung to the tune of Toni Basil's smash hit Mickey: "Oh Mickey you're so fine, you're so fine you blow my mind, hey Mickey." But Mkhitaryan is not fine, and in fact, he is blowing minds for all the wrong reasons with baffling performances in stark contrast to his days in Germany. The Armenian used to be up there as one of the best creative midfielders in Europe, as did Mesut Ozil. But where the latter has still been able to show his class, Mkhitaryan has struggled significantly. 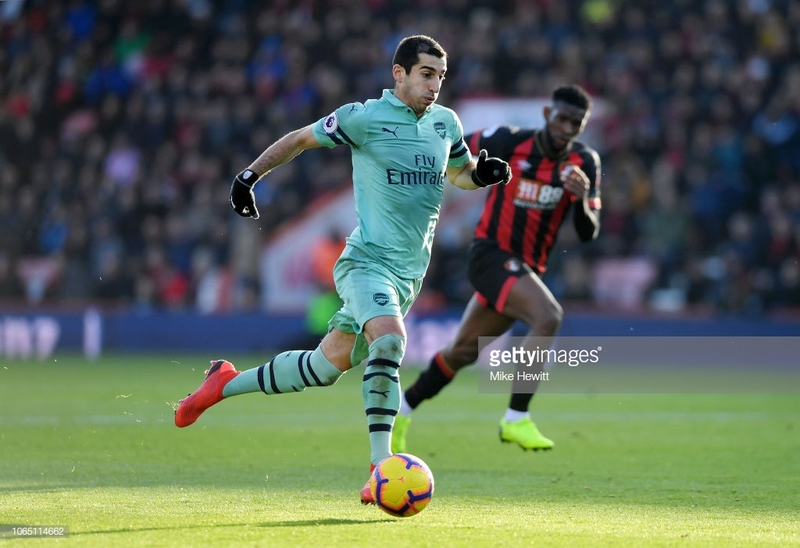 Against Bournemouth on Sunday it looked for all the world as though Mkhitaryan was about to wrap up the game for Arsenal. He was played through on goal by none other than ex-Borussia Dortmund teammate Pierre-Emerick Aubameyang, a player who has taken to England like a duck to water. But as the midfielder picked up the ball, he struggled to get it out of his feet and eventually took it too wide to score from, spurning a fantastic opportunity. It was a piece of play from Mkhitaryan that rather summed up his frustrating spell in the Premier League. It's funny how football works. Arsenal fans feared the absolute worst when rumours began to circulate of Alexis Sanchez's move to Manchester United. But with Mkhitaryan arriving in the opposite direction, it appeared a deal that initially would work in Arsenal's favour. Sanchez struggled and is still finding life difficult in the north of England, but Mkhitaryan showed initial signs of promise. He was a typical Arsene Wenger player. Good with the ball at his feet, tricky and able to get himself out of tight situations in attacking phases of play. He picked up three assists during his first start for the club in a thrashing versus Everton, whilst also helping himself to a goal in the Europa League at the San Siro, but that is about as good as it has got for Mkhitaryan. He's struggled for consistent numbers in the Premier League, scoring just five goals in 39 league matches for Man United, before adding just three in 19 matches so far for Arsenal. His statistics in Germany were considerably better, scoring 11 goals in 31 Bundesliga games during the 2015/16 campaign. He also supplied 15 goals for his teammates in league matches that season. So where has the Mkhitaryan of old gone? The attacking midfielder's form at Dortmund has never been replicated in England and it's difficult to put a finger on exactly why he's struggled so much. Jose Mourinho's inability to get the best out of creative players in recent seasons may have been one factor, but even after moving to an Arsenal side who loves to attack and give creative freedom to its players, he's still been inept. It's something which is hugely concerning when Mkhitaryan should be one of the best players at the club. What makes matters worse, is the fact that Arsenal are on the verge of letting longest serving player Aaron Ramsey leave for free because of the club's incoherent wage structure. The Welshman is on a reported £110,000 per week whereas Mkhitaryan is earning more. Arsenal would be better off letting the latter leave. Emery has been trying to cater for his two main goal scorers, Alexandre Lacazette and Aubameyang this season. This has meant that aspects of other parts of Arsenal's play has been restricted. This has seen the likes of Ramsey struggle for first-team minutes, whilst even Ozil was left out during Arsenal's win at the Vitality on Sunday. It isn't just Mkhitaryan who is finding life tough, but it is his displays which have led to some huge questions marks in recent weeks. Despite scoring a rather fluke goal as he had an impact off the bench against Wolves before the international break, his performances have been pretty abysmal. That was the case against Bournemouth. His ball retention was poor and when tasked with being one of the main creative outlets in what was a difficult away game, Emery may as well have started Ozil. Mkhitaryan has been given plenty of game time in the cup competitions this term. He's played in matches which you'd expect him to take by the scruff of the neck. Instead, he's looked rather lost. Against Blackpool in the Carabao Cup he never really got going and if you're struggling against a League One side you know time is running out. Some players have benefited from Emery's arrival. Particularly the likes of Alex Iwobi and Danny Welbeck before his injury, but Mkhitaryan is one of the few players who would have been better had Wenger stayed. It will take a couple of transfer windows for Emery to really start making this his own team. There are still problems from the days of Wenger and because of that decisions will have to be made in January and next summer over players who aren't up to the task. The Spanish manager is far more cut-throat than his predecessor and at this rate, Mkhitaryan may be one of the first to depart the scene.